Please refer to our stock # 1932 when inquiring. 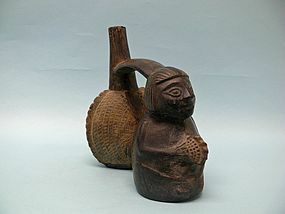 Chimu Inca Blackware Double Bodied Figural Vessel. Peru, ca. 1200 - 1500 C.E., Double-lobed, bridge-spouted vessel whose front lobe depicts a plump man holding a large spondylus shell in hands.Distinctive bowl-cut hair style with detailed facial features. Chip on spout, some wear due to age but in good condition. 6 3/4" height x 4" width x 7 1/4" depth. The Chimu people (900-1450 CE) of Peru produced distinctive blackware pottery. The vessels were created by smoldering flames during the firing and then buffing the surface to produce a dull sheen. Many of the pottery forms were adapted from the Moche culture, which preceded the Chimu in the Andean region of Peru. Vessels were mass-produced through the use of molds. Chimu pieces were rarely painted; decoration usually took the form of sculptural additions or carved forms, particularly of animals such as cats, dogs, frogs, and birds. One type of pot originally developed by the Chimu culture is the double-chambered “whistling” pot, which consists of two chambers with their spouts linked together by a horizontal bar through which liquid could pass. As the fluid was rocked back and forth between the two cavities, labored breathing sounds similar to those of the dying were produced. Because of this association with death, many believe that this popular form of vessel was used as a funerary object. Music was an important part of many pre-Columbian cultures, particularly in religious ceremonies, as evidenced by the numerous instruments found in the tombs and ruins of ancient cities. Instruments were played to accompany processions of priests, to signify the climax of certain ceremonies, and to complement sacrificial rites. All of these observances were performed in the hopes of pleasing the gods who were believed to be soothed by the sound of music. Typical musical instruments included flutes and rattles made of fired clay, conch shells used as trumpets, and drums made of turtle shells or hollowed out logs.